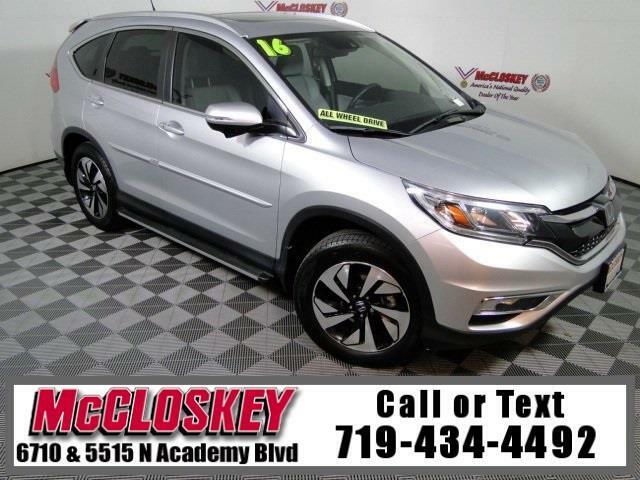 Reliable and luxurious 2016 Honda CR-V Touring All Wheel Drive with Power Moon Roof, Navigation System, Adaptive Cruise Control, Lane Departure Warning, and Push Button Start! The Touring tacks on 18-inch wheels, projector beam headlights, a power liftgate, adaptive cruise control, lane keeping assist, a forward collision mitigation system with automatic braking, a lane departure warning system, driver seat memory settings, a navigation system and HD radio. Every 2016 Honda CR-V comes with a 2.4-liter four-cylinder engine rated at 185 horsepower and 181 pound-feet of torque.